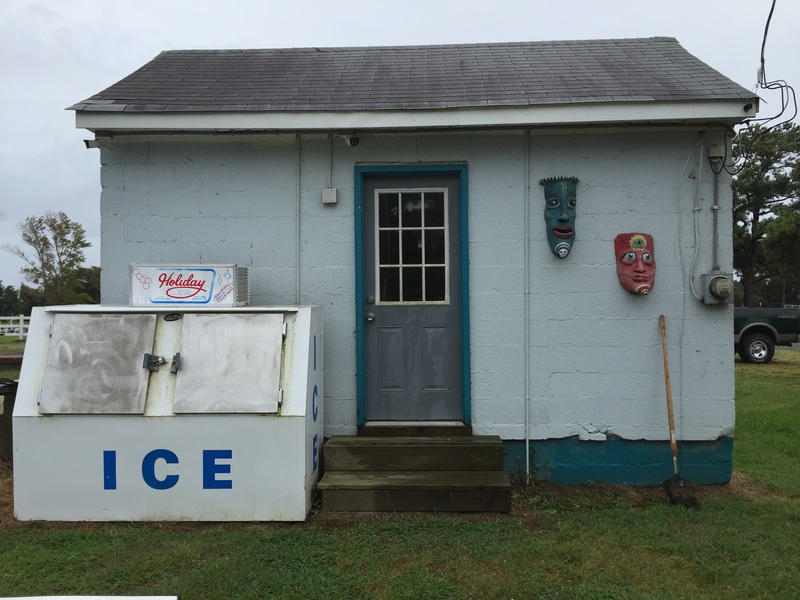 KNOTTS ISLAND, N.C. — Back in Washington, four-and-a-half hours and a million miles away, oysters are two, three, four bucks a pop. Here, they’re free. They crowd the mudflats and marshes, white like snowflakes, punctuated here and there by dead leaves, downed twigs, and the boards and boots and bottles that wash up here from someplace else. Knotts Island—in spite of its name, more peninsula than island—forms a hook between Back Bay and the Currituck Sound, between the mainland and the Outer Banks. It sits, most of it anyway, just below the 36.5th parallel, an imaginary line proclaimed by the King of England almost 400 years ago, surveyed by Jefferson’s father a century later, and trigger of the Civil War a century after that which still determines the shapes of eight states today. The entire population of just over 2000 crowds the eastern third of the island, facing the Outer Banks. The remainder of the island, mostly marshland, is now a wildlife preserve, a layover point for over 10,000 snow geese each November. From the air, a nearly straight line of trees bifurcates the island, separating cattails and loblollies to the west from the east’s organized patchwork of fields, mostly corn and soybeans, now some cotton, even a vineyard or two. In the 1860s, there was even a Tomato-Catsup plantation. Today, the refuge, a flat, watery landscape of rushes and mud, provides an imperfect wall against development. Plans for subdivisions with watery names like Swan’s Haven were drawn up, and islanders began to complain of congestion. But the refuge stands in the way: the only way to the habitable parts lies across a lonely, winding causeway. Somewhere out there lives the island’s resident monster, Marshman, a 7-foot-tall, gray gorilla with a long beard and an unmistakable stench. The only things above sea-level are a single power line, the occasional tree, and yourself. Before it was a preserve, it was the estate of Joseph Knapp, the New York-born founder of Ducks Unlimited who, like others, would retreat to elaborate hunting lodges on Southern shores to hunt and fish. Even today, this is duck hunting country, the bread-and-butter of its artisans the production of decoys. Before Knapp, though, it was home to Thomas Dixon, Jr., the Baptist minister who wrote The Clansman, which became Birth of a Nation. And before that, it was the plantation of the man for whom the preserve was named. Legend has it Mackie was buried vertically so he could oversee slaves even in death. Today, Currituck County is almost entirely white. Confederate flags still fly. Further back, things get murkier. This land was probably settled by colonists in the late-1600s, but no one knows quite when it happened or who was involved. Even the island’s namesake is lost to history, though one of Nathaniel Bacon’s rebels has been suggested. In the mid-1600s, Virginia and North Carolina disputed its ownership. A retired schoolteacher from Hawaii went there once with a psychic archaeologist to prove it was the Lost Colony of Sir Walter Raleigh. In the beginning, like all this land, it was Native American. Down the island, past Martin’s Vineyard (“not to be confused with Martha’s Vineyard,” warns the internet, not that you could if you tried), past the old Methodist church (whose website still speaks without sarcasm of the War Between the States), past waving Confederate flags, past Duck, Coot, and Black Bass lanes, tucked in a cove of the island’s eastern shore at the end of Brumley Road, lies Bay Villa, a marina home to the island’s only restaurant, Pearl’s. Pearl’s is a squat cinderblock building, more ranch than villa, done up tropical. It boasts a South Carolina palmetto, remarkably alive for this far north, and brightly-colored chairs. The walls are painted with pelicans, hibiscus, and Polynesian masks and the promise of ice, cold beer, and good times, at least the five months a year it’s actually open. The menu is the ubiquitous coconut-shrimp and mahi of these sorts of places. The rest of the marina, in the off-season, is a grassy point cluttered with the detritus of the past summer season, an old Holiday ice machine, more Polynesian masks, a dozen empty cars, and an American flag bent and battered by the winds off the sound. There isn’t a soul. 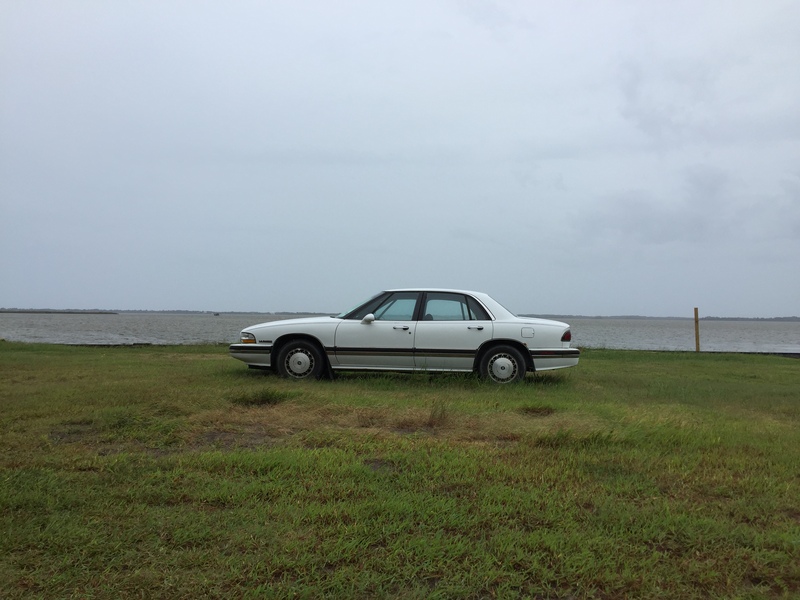 At the extreme south end of the island—past side roads named for their inhabitants, and another, Knotts Landing Lane, presumably not named for the soap opera—sits the car ferry. 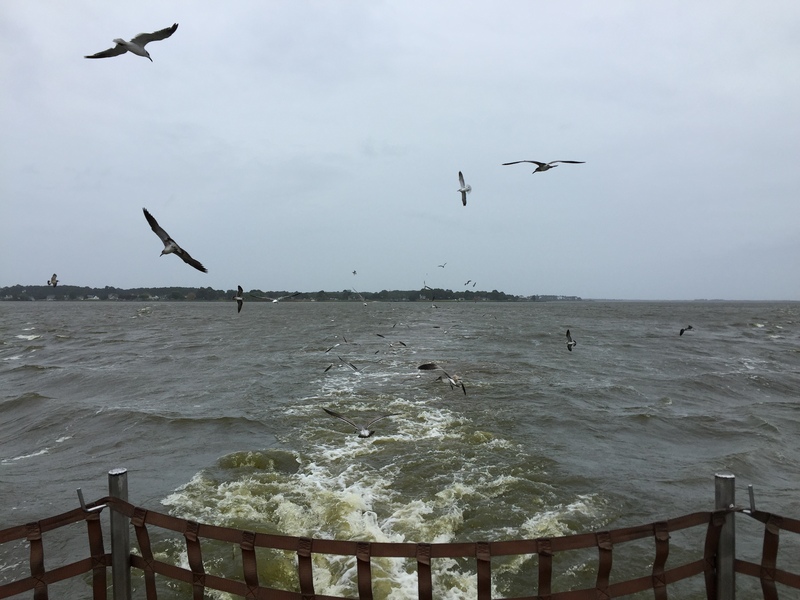 The ferry to Currituck across the sound, run by the state and free of charge, is the sole reliable connection to the rest of the state. The ferry, which began to eat away at that isolation, is a relatively recent innovation. It dates only to 1962, when high schoolers on the islands were rezoned to schools on the North Carolina mainland. Its opening, in early September at the beginning of the school year, was marked by a 1000-guest fish-fry and appearances by Miss Knotts Island and then-Governor Terry Sanford. By 1969, the nearly always empty ferry’s future was already in question. But a road was out of the question. 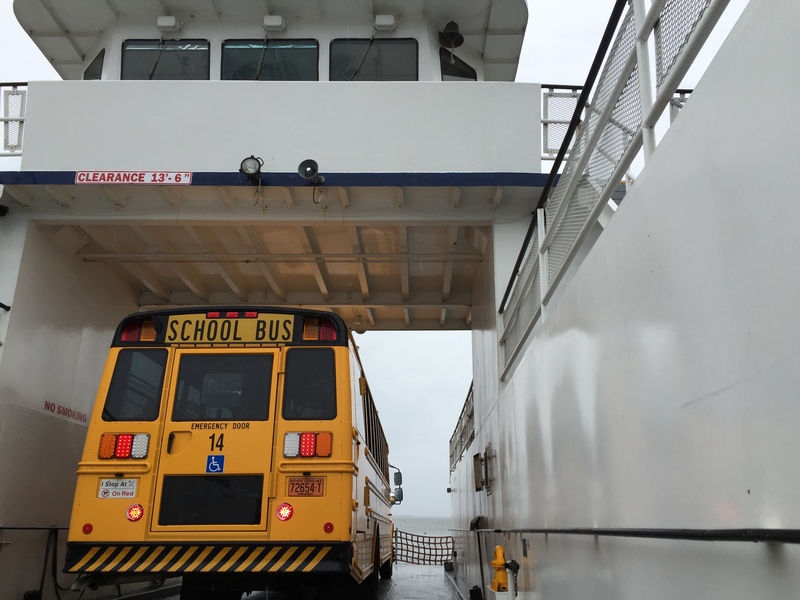 Even today, the ferry remains little more than a glorified school bus. When we headed across the sound to Currituck, the only other vehicle was the bright yellow school bus number 14, the only other person, besides the three- or four-person crew, its driver. The ferry’s framed rules, dated 1998, are student regulations: no smoking, remain in the cabin, no suspended students on the 7:00am or 3:30 runs. 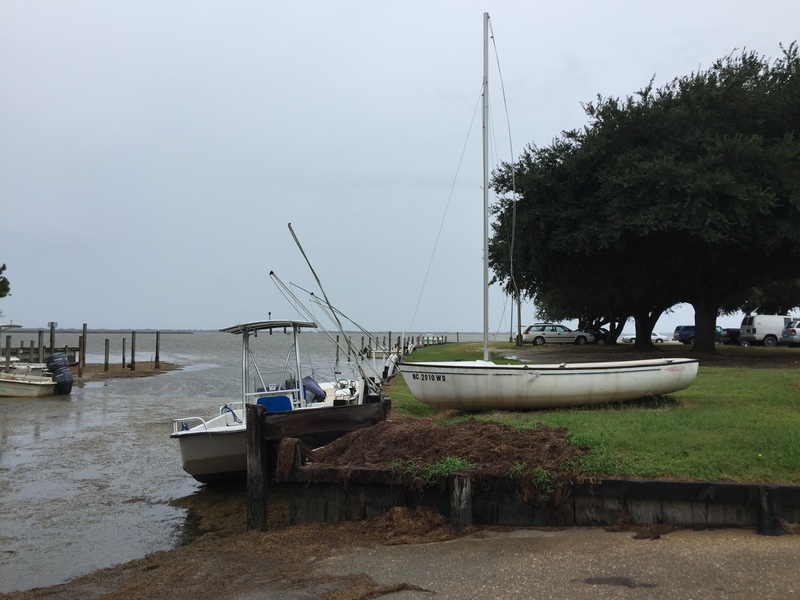 Like other islands along the Atlantic coast—Tangier and Smith in the Chesapeake, Sapelo among the Sea Islands—a running theme in the Knotts Island’s self-narrative is the pleasure derived from its isolation. In 1972, a Virginia Beach paper carried the headline that “progress,” in scare quotes, upset the islanders. The community’s longstanding insularity was preferable.“People around here settle their difficulties among themselves,” one said, which may explain the ferry’s gun ruffle ads. 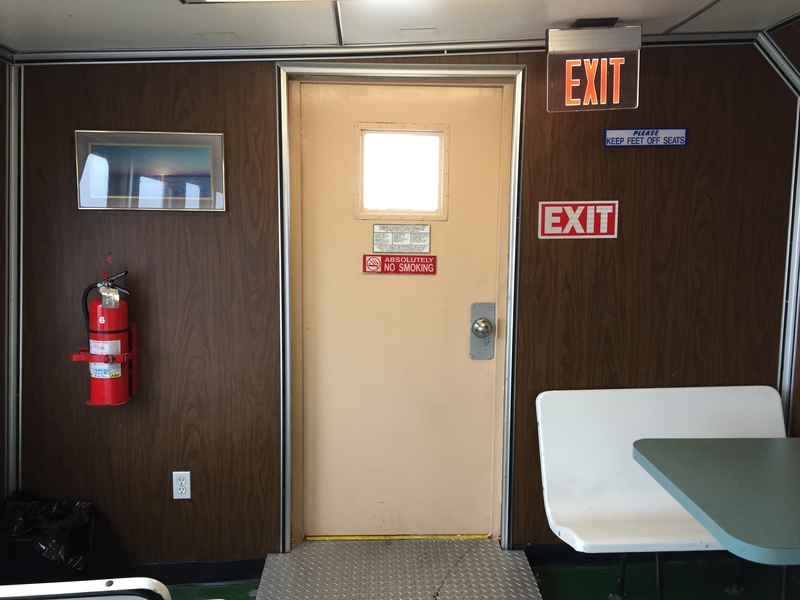 Aboard the ferry, the deckhands mumble, go about their work quietly and deliberately, and seem to leave outsiders alone. One of two books left in the cabin, Matt Hillon’s Judgment and Wrath, hints at a dismal view of the world outside the island. (The other, Jacob Bronowski’s The Ascent of Man, with a foreword by Richard Dawkins, paints a more complex picture.) As the island grows smaller and more faint behind you, and the bright orange daybeacons count down the distance to shore, the gulls dive for fish in the ferry’s wake. Even they seem to scream and chase you back to the mainland, back where you belong. This is an interesting part of the country. I’ve been to Okracoke, Duck and Pawley’s Island, and this gives a good feel for the less inhabited areas. Thanks for the visit and the history! Thank you for this info. I live in NC and never heard of this island. I’ll plan to visit it next chance I get.